Babies have been handled lots (daily since the mothers allowed us) and are now very tame little darlings. Currently 17 very healthy looking babies. I can start reserving now, I only ask that they go to good homes willing to care for them. They will come with information on how to care for Syrian hamsters. Price is £10 legally so as to prevent any being bought as reptile food! This is negotiable to good owners. 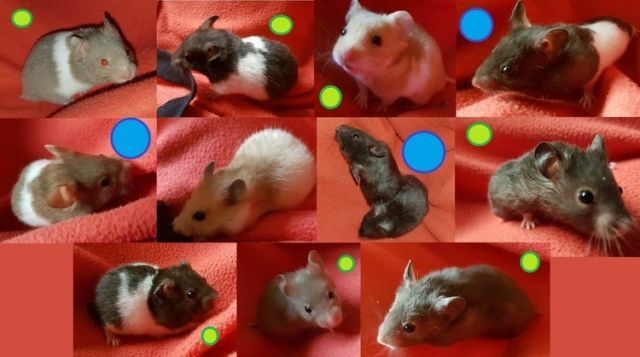 All hamsters that are currently reserved have a BLUE circle by them. All still looking for homes have a GREEN circle by them. 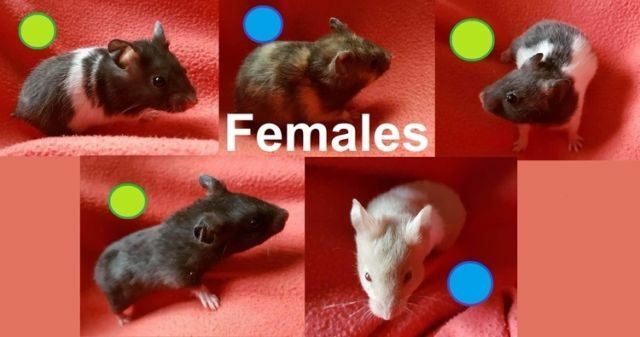 As they are reserved I'll update the colours, though since this site takes up to a day to update photos and I can't keep the ad taken off for updating often please feel free to ask who is left!